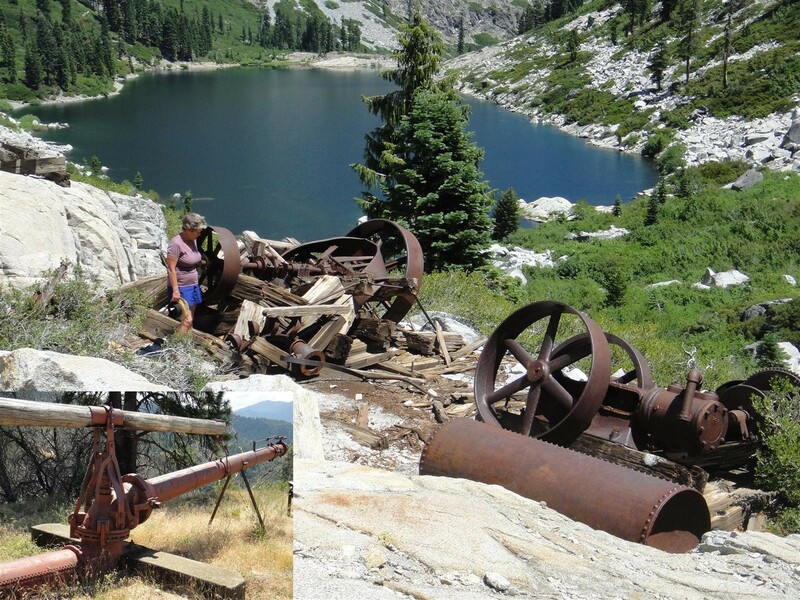 Remains of a steam donkey, winches and gears overlooking 5,500 ft. Emerald Lake in the Trinity Alps Wilderness. The equipment was used to build dams on Emerald and Sapphire lakes, in order to supply water to the LaGrange Mine nearly 30 miles away. When Baron Ernest de La Grange bought the Trinity Gold Mining Co. in 1892, the former owners had already begun to tap the waters of East Weaver and Little East Weaver creeks for hydraulic mining. La Grange knew the key to efficient hydraulic mining was one of scale, and to maximize the scale he would have to increase the amount of available water. First Rush Creek, then the Stuart Fork of the Trinity were diverted to supply the vast quantities needed to run three hydraulic monitors simultaneously. By 1898, Emerald Lake water was flowing to a reservoir high on Oregon Mountain at around 600 gallons per second -- a rate that would fill the Arcata Community Pool in six minutes! The water came via 17 miles of ditch (part of which can still be seen next to the Morris Meadows trail); a two-mile inverted siphon with a 1,200-foot depression (a section survives at Bridge Campground); nine miles of wooden flume; and a two-mile tunnel. The original Oregon Mountain reservoir delivered huge quantities of water at high pressure to the monitors 650 feet below. The mountain didn't stand a chance. "For the last several days, I've gone on long mountain excursions to inspect the job from one end to the other. ... The ditch is fourteen and a half miles long and has been fortified on one side with a wide bank of dirt, whereas the other side is solidly supported by the mountain. ... The trail along the ditch is so narrow that our little horses need all their skill to stay on it. One false step would send steed and rider into the abyss. "I spent yesterday next to a monitor, admiring the beautiful imposing spectacle of this hydraulic force of 3,000 horsepower. ... The strong current pulverizes the base of the cliff with an enormous roar. The man holding the monitor can change its direction with a slight turn of shoulder, reducing this mass of earth into liquid mud which then flows into the sluices like a torrent, filling the wooden interstices of these primitive strong-boxes with the precious metal. I have the great pleasure of climbing up and replacing the worker on the platform, while he shows me where to direct the spray." The mine closed at the end of World War I, plagued by rising costs and flat gold prices. By then, miners had blasted 100 million cubic yards of dirt and gravel from the face of the mountain, yielding $3.5 million in gold, worth about $400 million today. In the mid-1930s, the California State Highway Department restarted the old Stuart Fork hydraulic system as a cost-efficient method for constructing the present route of Highway 299. The six-year project entailed sluicing out a 210-foot-deep cut over Oregon Mountain, moving another 11 million cubic yards of dirt in the process. When opened in 1940, the new route cut the distance from Junction City to Weaverville by nearly three miles. Barry Evans (barryevans9@yahoo.com) marvels at the effort it took to extract a total yield of less than seven tons of gold.